Traveling always makes me think about new donuts. New donuts always make me think about recipes. And, since there has been an influx of new donuts flavors at both local shops and chain stores as of late, I thought it best to dedicate today's Nut to just that; recipes. In a bread machine pan add the milk, water, beaten egg, melted butter, sugar, bread flour, salt, nutmeg, and yeast in the order recommended by the manufacturer. Set machine to the sweet dough cycle (see Editor's Note for using your stand mixer). Once the dough cycle is completed, turn the dough out onto a floured board and let it rest for 10 minutes. Roll the dough out to a 1/4-inch thickness. With a floured cookie cutter, cut into 2 1/2-inch rounds. Place 1/2 teaspoon jam or jelly in center of half of the rounds. Moisten edges with cold water; top with the remaining rounds, pinching edges together firmly. Place the sealed doughnuts on an greased baking sheet. Cover and let rise until doubled in a warm place, about 45 minutes. Heat oil in deep fryer to 375 degrees F (175 degrees C). Fry one layer of doughnuts at a time. 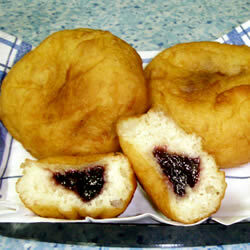 Turn doughnuts as they rise to the surface until golden brown, about 2 to 3 minutes. Remove from oil, being careful not to poke doughnuts. Drain onto paper towels and toss with sugar, if desired. Send us your pictures and enjoy!